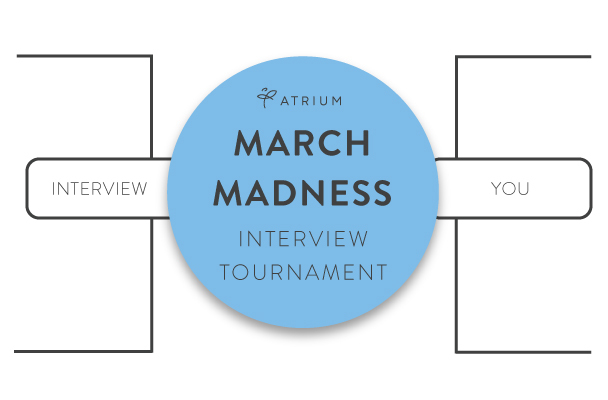 Similar to a March Madness bracket, the interview process is composed of multiple “rounds.” Each round presents new challenges and tests a candidate’s ability to overcome adversity. On the road to victory there will be many lessons learned, but in the end, only one champion will be crowned. By landing the opportunity to interview, you’re qualified to compete. Your stats and track record have proven you deserve a shot, but now it’s up to you to bring your A game. Do you have what it takes to bring home the glory? This is your first test, so be sure to take it seriously. Remember, the candidate pool at this point is still pretty packed, so you’ll need to work hard to showcase your skills and slam dunk the first impression. Phone interviews can lead to quick eliminations, even for proven performers, as companies attempt to narrow down the playing field. 1. Find a quiet place to conduct the interview so you can prevent any loud background noise and distractions. 2. Get excited! The tone of your voice should be enthusiastic – you want this right? 3. Avoid the awkward silence – you want to sound natural and unrehearsed, but waiting too long to answer can get awkward! During this round, expect more than your standard interview questions. Your potential employer will dive deeper into your past experiences and will most likely ask you to reference specific examples of challenges or accomplishments you’ve experienced in the workplace. Come prepared with a detailed list of questions about the position and the company. For an easy lay-up, end the interview by inquiring about the next steps in the hiring process. Making it to round three means your odds are looking pretty good, but don’t underestimate the competition. In this round, you’ll encounter potential peers and have a somewhat-candid conversation about the overall company culture and office vibe. This meeting is the perfect time to highlight skills and experiences that make you a true team player and demonstrate your ability to adapt. You’ll be hit with a flagrant foul for cloning your examples and analogies in all three interviews. Each member of the team is looking to have a unique interaction with you, so don’t give the same performance every time. For every question you anticipate, add 2-3 answers to your playbook. This is definitely not the time to be complacent. You’ve made it this far, so don’t throw it all away. With only a select few left vying for the title, the competition is fierce so 3-pointers are key. 1. Project confidence – meeting with the team “All-Stars” can be intimidating but you’ll need to convince them to pass you the ball. 2. Show off your technical skills – you’re the best player on the court, so keep shooting! 3. Strive for “perfection” – show you’re ready and willing to continue to work on your game. 4. Luckily, NCAA rules don’t apply here, so be sure to bet on yourself. This post was updated on March 22, 2019.